It’s always interesting to see developers add support for new, or existing, technologies in a silent an sneaky way. It appears that Turtle Rock Studios has done just that as they are going to eventually unlock a variety of NVIDIA GameWorks features to be added to Evolve. 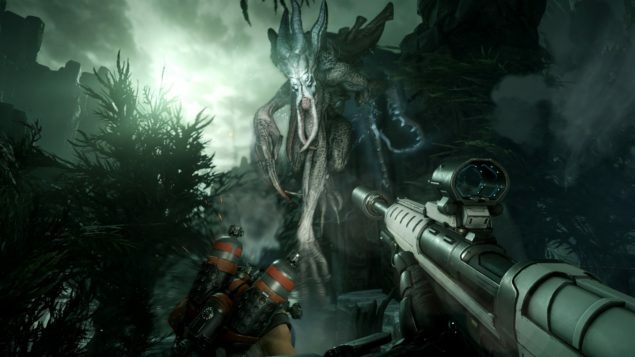 Evolve will apparently be getting support for NVIDIA’s GameWorks suite of effects that could potentially increase the fidelity of an already great looking game. On February 10th, NVIDIA noted in their blog that they’ve been working closely with the makers of Evolve, Turtle Rock Studios, in order to ensure that it’s not just a graphical port of a console game. Their goal was to be able to take advantage of CryEngine and enable its full potential. It’s already a good example of the capabilities of Crytek’s now aging engine (compared to the release of Unreal Engine 4 and the development of ID Tech 6, not to mention other engines). In a paragraph that probably slipped through a lot of other peoples radars, NVIDIA has stated rather succinctly that they will be adding official support in the future. No actual date has been confirmed, however they did pretty much just pledge their support. NVIDIA GameWorks integration is a great win for PC gamers because of how it can actually affect the visual fidelity of the game. The technologies therein can actually provide a pretty tangible difference, though performance can also take a bit of a hit as a result. This of course means that you’ll need an NVIDIA card in order to take advantage of these things, which also means that consoles will not be getting any sort of similar graphical upgrade. I’ve embedded a video that shows the actual differences in using those features in FarCry 4. GameWorks is a library of effects that are easily accessible by developers and allows them to integrate them into pretty much any graphics engine. This includes a far better facial geometry rendering, TXAA support, HBAO+, hair that’s comparable to AMD’s TressFX rendered hair, better physics rendering, as well as tools to make turbulent effects and even fire look more realistic. It’s NVIDIA’s attempt to help differentiate the PC and truly take advantage of all it has to offer. In all, it’s a good thing. It’s a wonderful thing, so that we can have better looking games like we know we can. Some developers may not necessarily have the time and resources to implement more advanced features, this takes away most excuses.